Railpictures.ca - A.W.Mooney Photo: With the recent chatter about the upcoming demise of the old Ingersoll, Ontario CN station, I felt it appropriate a time to dig up a shot of the structure in somewhat better years. 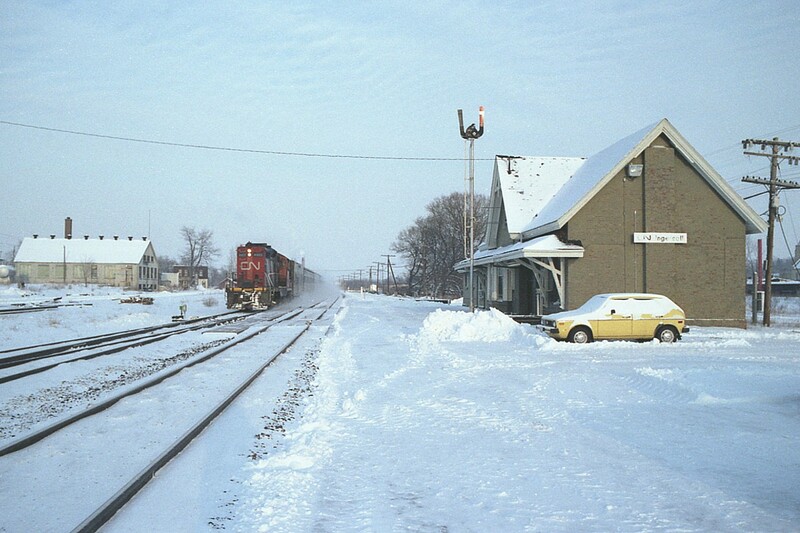 Even 37 years ago there is not much evidence of activity as a westbound passenger train roars by. The locomotive assigned on this particular move is CN 4423. For some reason I just cannot seem to recall any GP9s of the 4400 series on passenger assignment. For me an unusual sighting on what was one bitter cold January day. | Railpictures.ca – Canadian Railway Photography – photographie ferroviaire Canadienne. Caption: With the recent chatter about the upcoming demise of the old Ingersoll, Ontario CN station, I felt it appropriate a time to dig up a shot of the structure in somewhat better years. Even 37 years ago there is not much evidence of activity as a westbound passenger train roars by. The locomotive assigned on this particular move is CN 4423. For some reason I just cannot seem to recall any GP9s of the 4400 series on passenger assignment. For me an unusual sighting on what was one bitter cold January day. It’s nice to see images of that station in better days and for some reason that little yellow car adds to the scene. A 4400 or 4500 series GP9 would only be assigned to a corridor passenger train in dire straits. They had 65 mph gearing, so they likely weren’t able to keep up with the schedule. GP9s 4100-4107 had 89 mph gearing, as well as steam pass-through piping, so they could be anywhere in a passenger power consist. Any freight unit assigned (like 4423) had to be ahead of any units with a steam generator.